The year 2017 has not been kind to the US Navy, which has suffered a series of accidents –with a total of 20 fatalities - in the Pacific Rim region. Everything from sleep deprivation to poor training has been blamed. The latest incident to rock the US Navy – specifically the Seventh Fleet, which is headquartered at Yokosuka, Japan – occurred at the weekend when the USS ‘Fitzgerald’, a guided missile destroyer, “suffered two punctures in her hull” as it was being loaded on to the transport ship ‘Transshelf’, according to a US Navy public statement. Under normal circumstances, such an incident would not seem very significant, but these have not been normal times for the US Seventh Fleet, which has been plagued by a series of mishaps involving highly-sophisticated vessels. In fact, the ‘Fitzgerald’ was already in dock for repairs following a deadly collision on June 17 with a Philippine container ship about 150km (92 miles) southwest of Tokyo. The incident, which nearly caused the vessel to sink, claimed the lives of seven crew members and fueled intense speculation as to how a modern warship, equipped with state-of-the-art navigational equipment, could suffer such a mishap in clear weather. Meanwhile, in the same week that the ‘Fitzgerald’ was damaged, for the second time, a US Navy aircraft crashed into the ocean off the coast of Japan. The C2-A Greyhound transport plane was carrying 11 crew and passengers to an aircraft carrier when it crashed into the Philippine Sea, the US Navy said. Three out of the 11 people on board the aircraft perished. Of the seven accidents to strike the Seventh Fleet this year, the worst involved a collision between the USS ‘John McCain’ – the same type of ‘guided-missile destroyer’ as the ‘Fitzgerald’ – and a merchant ship east of Singapore on August 21. The collision ripped a gaping hole in the destroyer's hull, trapping sailors inside a sealed compartment on the vessel. Ten crewmen lost their lives and five were injured. The warship had reportedly just conducted a ‘freedom of navigation’ operation in the vicinity of one of China's man-made islands in the South China Sea, which have in the past been the source of much contention between the United States and China. The US Navy, which said both accidents involving the ‘Fitzgerald’ and the ‘John McCain’ were “avoidable,” ordered a “pause in operations” in order to review training policy of crew members. In September, during a Senate Armed Services Committee, navy officials admitted that many crew members deployed to the overseas fleet “are not up to date on warfare certification,” a worrying statement given the lethality of the vessels under their supervision. Another explanation for the rash of mishaps was 'sleep deprivation' among crew members, who are expected to constantly keep pace with rapidly expanding overseas operations. Indeed, a comment by John Pendleton, director of defense capabilities and management at the US Government Accountability Office, suggested that the navy is simply being overstretched and overworked. Whatever the case may be, the accident-prone US Navy is fueling speculation over its readiness, especially as tensions continue to flare between the Trump administration and regional powers, like North Korea and even China. Following the collision, the China daily published an editorial that claimed the US is becoming a “hazard” in the South China Sea. “The US Navy, which likes to claim its presence can help safeguard ‘freedom of navigation’ in the South China Sea, is proving to be an increasing hindrance to ships sailing in Asian waters,” the newspaper wrote. Here are some of the accidents involving the US Navy since the beginning of the year. - In late January, the USS ‘Antietam’, a US Navy guided-missile cruiser, ran aground off the coast of Japan, resulting in damaged propellers and spilled oil. The incident did not result in any injuries, but the leakage of 1,100 gallons of oil alarmed environmentalists. - June 17, collision involving the USS ‘Fitzgerald’, resulting in the deaths of seven US sailors. - August 21, collision involving the USS ‘John McCain’. Five sailors were injured and 10 sailors died. - November 18, the guided-missile destroyer USS ‘Benfold’ (DDG 65) was participating in a scheduled towing exercise Nov. 18, when a Japanese tug boat lost propulsion and drifted into the ship. No one was injured on either vessel. - November 22, a C2-A Greyhound transport plane carrying 11 crew and passengers crashed into the Philippine Sea, resulting in three fatalities. 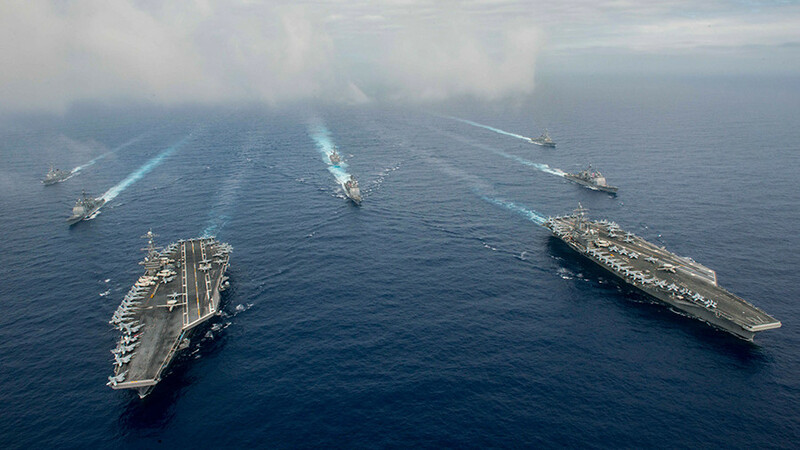 The US Seventh Fleet is the largest of the forward-deployed US fleets, comprising some 70 ships, 300 aircraft and 40,000 Navy and Marine Corps members.